Nail fungus infection or Onychomycosis or ringworm of the nail, is a common problem that affects over 50 million people. Often, people get this fungal infection due to the ability of fungus to breed in warm and moist places. 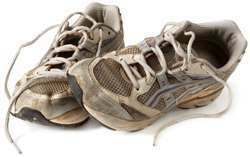 The inside of your shoes are the perfect breeding ground for toe nail fungus because of the sweat, heat and darkness. You may have seen a white or yellow spot under the tip of your toenail or fingernail in the beginning. But once the fungus spreads, it may cause your entire nail to become yellow, brown or even black. The nail also becomes thicker and may crack or have crumbling edges. The nail fungus grows and lives underneath the nail bed of your fingers or toes. It may be painful as well as look unsightly. What most people don't realize is that nail fungus infections are contagious and can spread to other nails and even other people. The most common form of nail fungus is found in toenails because the feet are usually confined to dark, sweaty place inside your shoes, the perfect environment for this kind of fungus to grow and thrive. There is a good chance that you picked up the infection in a shower room, locker room or pool area. And then, if the toenails are too short, or you have a cracked nail, infection can set in easily. Athlete's foot is also a fungus that can spread to the toenails. And age can also be a factor in the growth of and susceptibility to nail fungus. Some people get exposed to fungal infection on their finger nails when getting a manicure in a salon. Bacterial, fungal and viral infections also can occur from using unsanitary equipment if they are used on many people. If the equipment is not sterile, the salon passes the fungus from one person to another. Of course this can also happen to the toenails when the equipment for a pedicure in a salon is not clean. Women often get fungal infections from acrylic nails. A fungal infection may set in if acrylic nails are left on too long and moisture then accumulates under the nail. Another cause may be extended time of your hands being in water, on a regular basis. This is a hazard in some jobs where hands are immersed in water for long periods of time. What Are The Three Types of Nail Fungus Infections? There are a few types of nail fungus infections, but these are the 3 most common. Usually, nail fungus is caused by a dermatophytes fungus. This is where the fungus invades the space between the top area of the toe and the tip of the nail or the skin at the side of the nail. The toenail will turn yellow and may then separate from the nail bed under it. If not heals, the nail becomes brittle, may fall off and gets darker and darker in color. But yeasts and molds are also known to be responsible for nail fungal infections. Candida Albicans (yeast infection) is seen more in fingernails than toenails. The infection causes the nail to become yellow or green or foggy in appearance. Nail Fungus usually invades fingernails of people who frequently immerse their hands in water. If there is a cut, crack or prior damage in the nail like infection or trauma, yeast infection can set in. Molds are less common, but are usually caused by walking barefoot in the garden or outside where there can be a risk for catching molds. Again, the fungus may enter the nail through a crack or small cut. If you get a manicure or pedicure, bring your own tools. Inspect the salon to insure that they sterilize all their instruments and the basin where you put your feet or hands. Refuse to allow your hands or feet to be subjected to utensils used on other people unless properly cleaned. Don’t keep your feet in sweaty shoes and socks. Wear sandals or go barefoot (at home) whenever possible. Put foot powder in your socks and shoes. Be sure that your shoes are not too tight for your feet. Put on clean socks when they get sweaty or wet. Make sure your feet are as dry as possible. Change your shoes and socks after you engage in any sports activities. Do not walk barefoot in locker rooms, pool areas or public showers. Why use ClearFungus Instead of Prescription Nail Fungus Treatments? Doctors frequently prescribe oral medications, pills that you swallow, for fungal infections. They may work well to clear the infections. But, think twice. Do you really want to add anti-fungal drugs to your system? They need to be taken for 4 to 6 months in order to be effective, and during that time, you are exposing your liver, stomach and skin to very strong and potentially dangerous poison. Antifungal oral drugs for nail fungus cause many undesired side effects like severe skin rashes and liver damage. They are not recommended for people taking other medications, or who have liver, heart or many other medical problems. The oral medication can cause diarrhea, stomach pain, vomiting. Skin problems like rashes that do not go away, itching or hives also are frequently experienced. Some more serious side effects may also occur like dark urine, pale stools, sore throat, and other signs of internal infection. Prescription oral nail fungus treatments can also affect the bone marrow. If your doctor does prescribe this kind of oral medication, you should insist on monthly blood tests during treatment. ClearFungus, The Effective Nail Fungus Treatment, on the other hand, is a topical treatment. ClearFungus is safe and made of all natural ingredients, and cannot enter your body to cause damage to any organs. It is effective, and it works. For more information on the benefits of ClearFungus, click here.